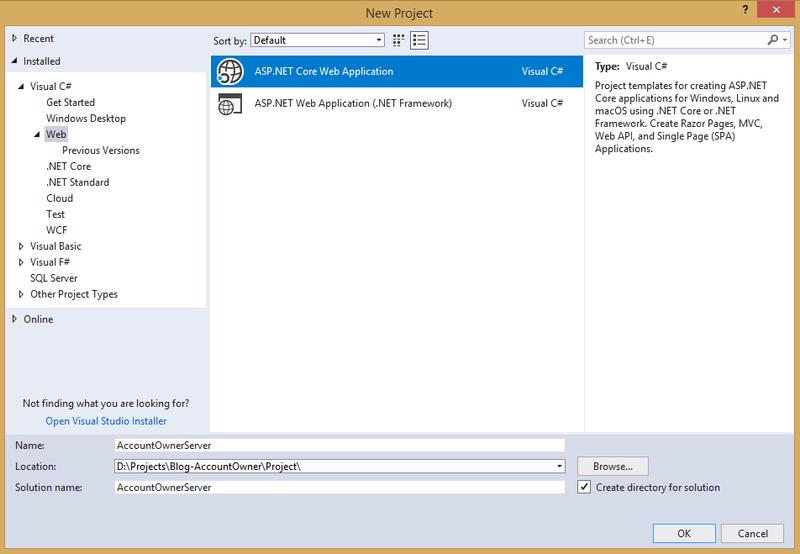 .NET Core configuration differs greatly from the standard .NET projects. We don’t have anymore a web.config file but instead, we use a built-in Configuration framework that comes with the .NET Core. Therefore having a good understanding of how to configure your project and how to configure the services, which you will use until the end of the development process, is a must. In this post, I will explain to you how to use the configuration methods in the Startup class. Also, you will learn how to register different services and how to use extension methods to help you achieve this. If you want to see all the basic instructions and complete navigation for this series, please click on the following link: Introduction page for this tutorial. 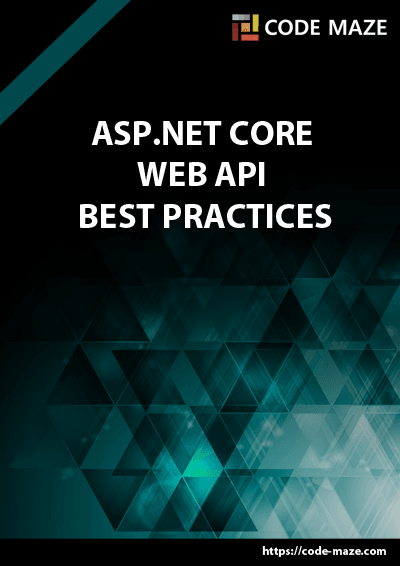 In the next window choose Web API and from the left drop-down list choose .NET Core. Also, from the right drop-down choose ASP.NET Core 2.0. After all that, just click the OK button and the project will load. 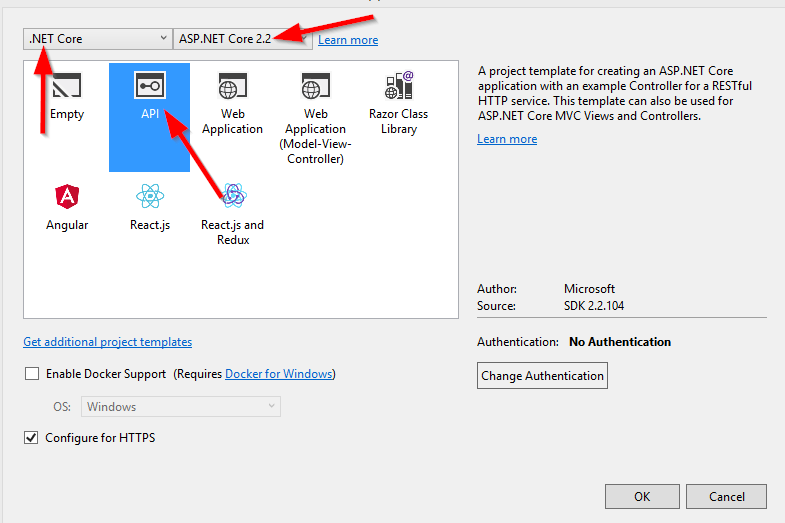 After the project has been created, we are going to modify the launchSettings.json file which is quite important file for the .NET Core configuration. Let’s change the applicationUrl property and the launchBrowser property to false, to prevent web browser to start when the project starts. 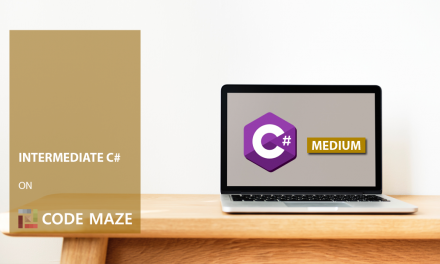 If you are familiar with the .NET Core 1.0, you will find that this code, related to .NET Core configuration, is considerably smaller than it used to be. Also, you could think that many parts are missing like the UseKestrel() or the UseIISIntegration()… but that is not the situation. Method CreateDefaultBuilder(args) encapsulates all that stuff inside, making this code more readable and quite smaller, but still keeping all the magic present. You can also notice this part of the code: UseStartup<Startup>(). The Startup class is a mandatory for the .NET Core, in which we configure embedded or custom services that our application needs. When you open the Startup class, you can see the constructor and the two methods, which content we will change during the application development. In the method ConfigureServices, you will do exactly that, configure your services. 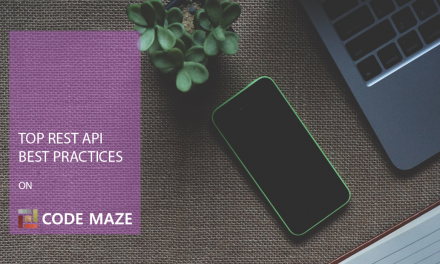 Furthermore, in the method Configure you are going to add different middleware components to the application’s request pipeline. All of our configuration code could be written inside the ConfigureServices method, but large applications could potentially contain many services. As a result, it could make this method unreadable and hard to maintain. Therefore we will create extension methods for each configuration and place the configuration code inside those methods. An extension method is inherently the static method. 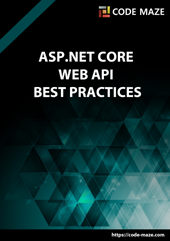 They play a great role in .NET Core configuration because they increase readability of our code for sure. What makes it different from the other static methods is that it accepts “this” as the first parameter, and “this” represents the data type of the object which uses that extension method. An extension method must be inside a static class. This kind of methods extends the behavior of the types in .NET. So, let’s start writing some code. We are using the basic settings for adding CORS policy because for this project allowing any origin, method, and header is quite enough. But you can be more restrictive with those settings if you want. Instead of the AllowAnyOrigin() method which allows requests from any source, you could use the WithOrigins("http://www.something.com") which will allow requests just from the specified source. Also, instead of AllowAnyMethod() that allows all HTTP methods, you can use WithMethods("POST", "GET") that will allow only specified HTTP methods. Furthermore, you can make the same changes for the AllowAnyHeader() method by using, for example, the WithHeaders("accept", "content-type") method to allow only specified headers. In the ConfigureServices method, CORS and IIS configuration have been added. Furthermore, CORS configuration has been added to the application’s pipeline inside the Configuration method. But as you may notice, there is a little more code. Therefore, I will explain it now. app.UseForwardedHeaders will forward proxy headers to the current request. This will help us during the Linux deployment. app.UseStaticFiles() enables using static files for the request. If we don’t set a path to the static files, it will use a wwwroot folder in our solution explorer by default. Concerning the .NET Core configuration, we could say that this is quite enough. Now you know how to modify the launchSetting.json file, the purpose of the Program and the Startup classes, how to configure services and finally how to create and use extension methods. Thank you for reading and check out the next part in which we will create our first service, logger service, and use it for logging our messages. Hi LODE. Thank you for the comment and the suggestion. Yes it is “LaunchSettings.json”, my bad and now it’s fixed. About the language problem, I know there is a lot of room to improve and I will accept any suggestion from you. There is a LunchSettings.Json in the conclusion :). I would love to help out, but English is not my native language. When starting new project does basic configuration matters? 2nd you could ask the question in a different and more a readable way: Does basic configuration matter when starting a new project? 3rd Spelling mistakes: ‘Configuration matters’ should be ‘Configuration matter’. Thank you again. I appreciate the help a lot. Hello Danny, thank you a lot for reading this post. About your error, please check your extension method ConfigureCors for the missing “this” keyword in front of your “IServiceCollection services” parameter. When I remove “this” keyword I get the same error as you are. So just check ConfigureCors method. You are welcome Danny. It’s my pleasure to help. I’m working with part 2 of your series of tutorials. I’m getting the error “The name does not exist in the current context” for the ForwardHeaders.all and Path variables in the startup.cs page. Please advise what I’m missing. I would really want to help you, but it would be much easier if you could send me your solution. Or you could download my solution (provided in the post) and compare for differences. Again, I want to help but right now (based on your error message) I can’t figure it out. Upload the solution and post a link here, then I am going to check it out and for sure find what is missing. One more time, thank you very much for reading the posts. I think I managed to sort the problem out. Two missing references at the top of the page, one to system.io and one to microsoft.aspnetcore.httpoverrides. Hope that’s all it is.